Also called minor seventh flat five arpeggio (m7b5), the half-diminished arpeggio contains four notes : Root (1), minor third (b3), diminished fifth (b5) and minor seventh (b7). It is seen as a diminished triad with a b7. How to Use The Half-diminished Arpeggio? Half-diminished arpeggios are usually employed over the iim7b5 chord of a minor II V I progression. It is also possible to play it over a dominant chord, starting on the third. This way you will highlight the ninth (9). Another interesting trick (as shown in the lick at the end of the lesson) is to play a m7b5 starting on the sixth (6) of a minor chord in order to highlight the thirteenth (13). Half-diminished arpeggios are related to half-diminished scales as the Locrian mode, which is the seventh mode of the major scale, the Locrian 13 or (aka locrian 6) the second mode of the harmonic minor scale and the Locrian #2 mode, which is the sixth mode of the melodic minor scale. How to Play Half-diminished Arpeggios on Guitar? 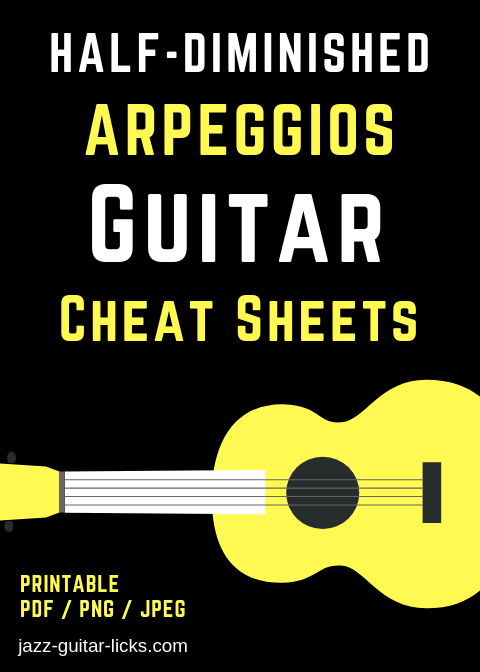 Here are four m7b5 guitar arpeggio patterns. 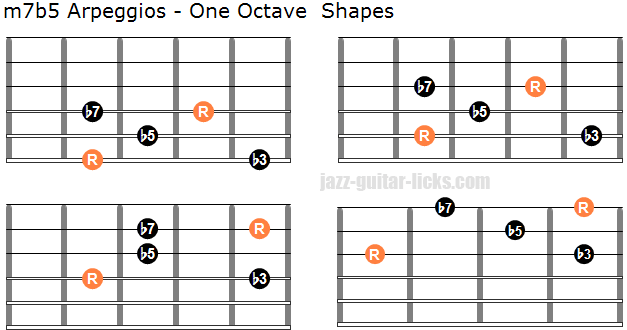 The notes of each shape are included within the space of one octave. Remember that the root is the most important note, it gives its name to the arpeggio. Playing the corresponding chord is a nice way to bring them together. The two diagrams show how to play mtb5 arpeggios within two octaves in order to cover the six strings. The first shape has roots on the sixth, fourth and first string. The second pattern has roots on the fifth, second string and first string. The root of Bm7b5 (B) is the thirteenth of Dm7. The b3 of Bm7b5 (D) is the root of Dm7. The b5 of Bm7b5 (F) is the b3 of Dm7. The b7 Bm7b5 (A) is the fifth of Dm7. Measure 1 : We can see a Bm7b5 arpeggio over the Dm7 chord. Measure 2 : b7 and root of G7. Measure 3 : C Ionian mode. The root of Bm7b5 (B) is the third of G7. The b3 of Bm7b5 (D) is the fifth of G7. The b5 of Bm7b5 (F) is the b7 of G7. The b7 Bm7b5 (A) is the ninth of G7. Measure 1 : D minor seventh arpeggio, ascending and descending. Measure 2 : Bm7b5 arpeggio over the G7 chord. Measure 3 : Ionian mode.